growers and their families, and celebrate the cultural diversity of Assam! 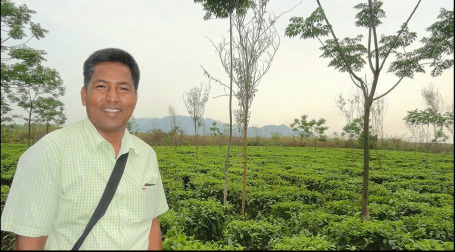 Introducing this month's featured tea grower - Gobin Hazarika! Dried over an open wood fire, this wonderful hand-made tea has just a hint of smoky flavour. It's grown and processed at the Meen Mohan Garden by small-scale grower Gobin Hazarika, with help from family, neighbours and friends from the nearby village. ﻿ the small tea co-op is a family-based business. For over 10 years, we've worked and lived in northeast India, meeting growers, learning how tea is grown and produced, and about the challenges faced by the small tea sector. We carry out our work differently than most tea retailers. Small tea co-operative's founders, Kel Kelly and Peggy Carswell, regularly provide hands-on training to tea garden owners and their staff. Preparing and applying compost made from locally-available materials (like chopped banana stem shown in this photo) is just one sustainable and low-cost alternative to the chemical fertilizers used at most tea gardens. For almost a century, the tea industry in Assam has been controlled by large, non-Assamese business interests. Relying on a work force originally brought in from other parts of India, it has historically offered few direct benefits to the people of Assam. In the early 1990’s, a number of Assamese families began planting and cultivating tea in an effort to improve their livelihoods. Today, most of the tea leaves they harvest are sold to bought-leaf factories - often at prices that barely cover production costs. Without access to processing equipment, technical and educational support or a market for their teas, many of the families who’ve shifted to growing tea as a cash crop are struggling simply to survive. The small tea co-operative is dedicated to assisting some of Assam's tea growers to develop the capacity to process and market their teas. Along with a limited quantity of these very special teas, we're also able to offer other naturally-grown teas not available elsewhere in Canada. and how small tea and our partners at Fertile Ground are helping out! Click on the image above to read Bijit's message. Contact us for prices and for information about where you can buy our teas. Convenient online ordering will be available soon! 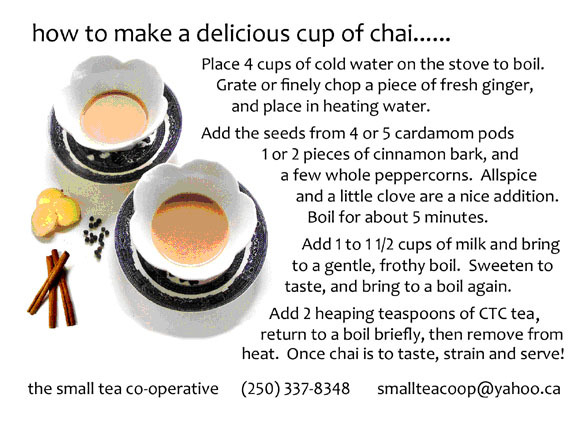 Download our fabulous chai recipe here!